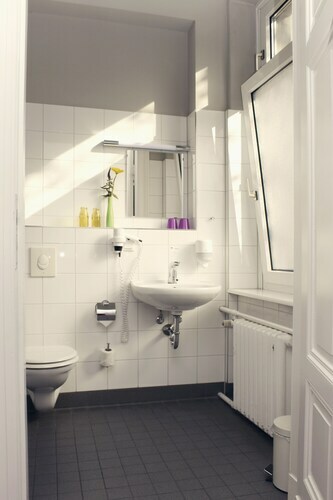 With a stay at Grand Hostel Berlin Classic, you'll be centrally located in Berlin, within a 10-minute drive of Checkpoint Charlie Museum and Brandenburg Gate. 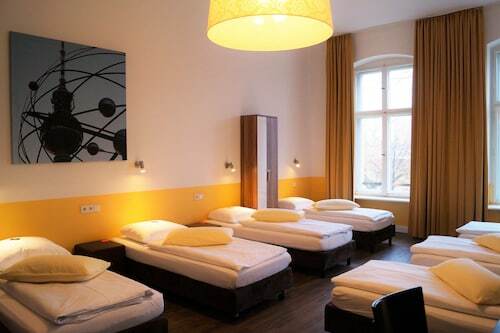 This hostel is 2.5 mi (4.1 km) from Alexanderplatz and 3.2 mi (5.2 km) from Reichstag Building. Make yourself at home in one of the 33 individually decorated guestrooms. Complimentary wireless Internet access is available to keep you connected. Conveniences include desks and blackout drapes/curtains, and you can also request irons/ironing boards. Take advantage of recreation opportunities including karaoke and bicycles to rent. Additional amenities at this Victorian hostel include complimentary wireless Internet access, a television in a common area, and tour/ticket assistance. Enjoy a meal at Grand Bistro or snacks in the hostel's coffee shop/café. Wrap up your day with a drink at the bar/lounge. Buffet breakfasts are served on weekdays from 8 AM to 11 AM and on weekends from 8 AM to noon for a fee. Enjoy a meal at Grand Bistro or snacks in the hostel's coffee shop/café. Wrap up your day with a drink at the bar/lounge. Buffet breakfasts are served on weekdays from 8 AM to 11 AM and on weekends from 8 AM to noon for a fee.Take advantage of recreation opportunities including karaoke and bicycles to rent. Additional amenities at this Victorian hostel include complimentary wireless Internet access, a television in a common area, and tour/ticket assistance.Pets not allowed Check-in time starts at 3 PM Check-out time is 11 AMFeatured amenities include a computer station, express check-out, and a 24-hour front desk.Extra-person charges may apply and vary depending on property policy.